Is there a adapter / mounting hardware out there for the edge v2 to fit onto 1155? Is the rassa block same mounting as the old x20 delta block ? edge v3? when did they release that? I have a edge v2 I bought in 2008 at i34 but never got around to using, might use in future but mounting issues with 1155(well I could use the sck775 mounting as the arcock mb I have has the mounting holes for it, but as mentioned theres a bent pin I need to sort out). The Edge was a fixed mounting plate with mutiple mounting holes, only 775 and 1366 are supported on this block for intel. It doesnt use the circular mounting like the Rasa and Raystorm use. im told its identical to the rassa got a mount there for 1155 /1156 ? in black ? Apologies, i thought you was talking about the original Edge with the fixed acrylic top. 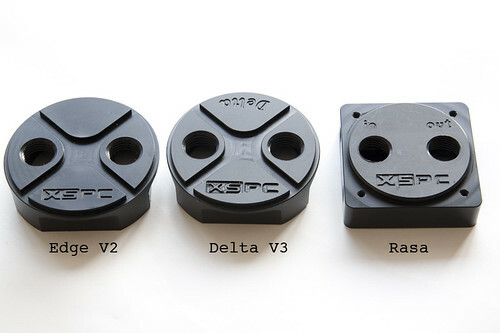 The Acetal Edge V2 uses the exact same mounting plate as the Delta V3 so you can get these compatible with the 1155, 1156. The Rasa block as you can see from the above is a smaller mount, so you wouldnt be able to use this. We only have the Chrome 775 / 1366 plates in stock here.. you may need to contact XSPC directly about the Chrome 775/1155/1366 plate. All Delta V3's come with the universal Intel plate. ok thanks for the swift reply rob.